We're over 9k! All money raised above 9k will go to improving the anthology: more words, more illustrations, and more readers for the audiobook! * free for everyone: a BONUS joke issue of Stone Telling with Rhymed Mermaids! * free to all backers: an extra SONG by the Banjo Apocalypse Crinoline Troubadours. *if you bid 20$ and higher: an audiobook of the anthology. * if you bid 25$ and higher: 1) a postcard by Bogi Takács featuring a random Ember Letter! 2) 5$ discount on a custom piece of jewelry from Wyrding Studios (piece must be over 50$; offer worth for 2 years). * if you bid 45$ and higher: not one, but TWO postcards Bogi Takács featuring random Ember Letters! PLUS, Saira Ali of Kitabiyat Press will create broadsides of one story from the anthology, printed on an antique letterpress, and send it to you at no additional cost! * if you bid 200$ and higher: a piece of Phoenix Jewelry created by Wyrding Studios especially for the project! UPDATE 7/28/2014: FUNDED, FUNDED, FUNDED!!! WE ARE FULLY FUNDED THANKS TO OUR WONDERFUL BACKERS AND SUPPORTERS! But wait! We still have 9 days to go! Available now: one postcard with a random Letter of Embers drawn by Bogi Takács, for backers who pledge at the 25$ level and higher! TWO random Letters of Embers postcards for those who pledge at the 45$ level and higher! IF WE REACH 8000$, one broadside of a piece from An Alphabet of Embers, printed on a 19th century letterpress will be available for no additional charge for all backers who pledge at the 45$ level and higher! REACHED!! 6500$ - internal B&W illustrations, for a more beautiful book!! REACHED!!! 7000$ - an anthology-themed song from Banjo Apocalypse Crinoline Troubadours, recorded as a VIDEO and sent to ALL backers! It will be amazing!! These people ROCK! They rock EXTREMELY HARD! REACHED! 8000$ - a JOKE issue of Stone Telling! Description below! NEW! 9000$ - AN AUDIOBOOK! So you know how I am really averse to rhyme, and also strongly dislike everything that has to do with mermaids? It's become something of a competition among certain poets to try to sell us rhymed mermaid poetry - so far, to no avail. If you have ever felt this dreadful urge, fret no more: the MERMAID issue of Stone Telling is for you! Shweta and I will look for the mermaidest, rhymiest poetry to showcase in a special April 1st issue (or, if we can't resist it, earlier). 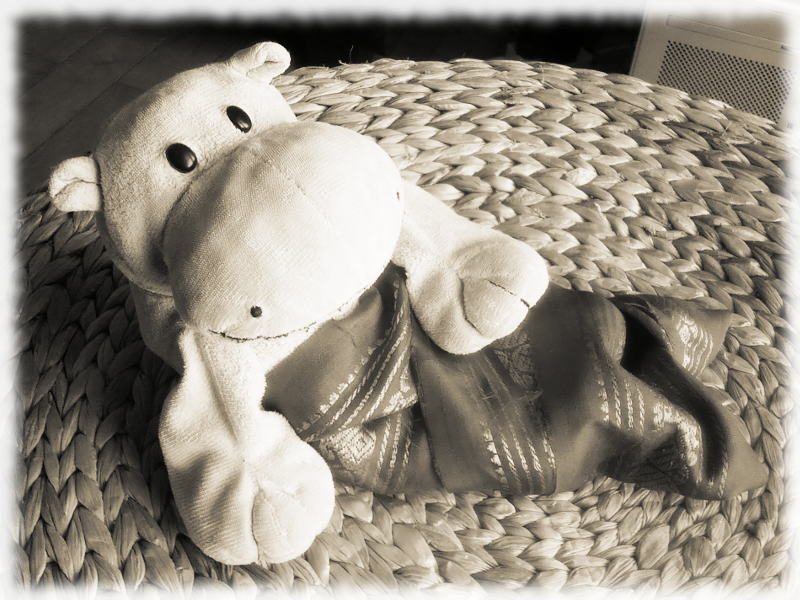 We'll also accept limericks, nonsense verse, and assorted ridiculousness, all to be lushly illustrated with artistic B&W photographs of the Mippo as a mermippo. This is your chance to inflict this marvel of marvels upon the world of extremely serious speculative poetry. Plus, it's sure to cheer you up on those days when absolutely nothing else does. Almost guaranteed to be better than cats! (Warning: may include cats). UPDATE 7/10/2014: submissions guidelines posted for your reference. Note that this is pending funding. UPDATE 7/9/2014 - we're almost halfway there! To celebrate, I am adding a new reward level, called VOICE OF THE SEASTAR, with CUSTOM POETRY by me (see below for details). Hi everyone. I am Rose Lemberg. You might know me as the editor of The Moment of Change (Aqueduct Press, 2012), and the founder and co-editor of Stone Telling Magazine. I also edited Here, We Cross, an anthology of queer and genderfluid poetry, which was published through my micropress, Stone Bird Press. With your help, I am looking to put together an anthology called An Alphabet of Embers. I want to make the kind of book you'd pick up when you're drowning for a gulp of beauty on a gray day. I will be looking for the short, the surreal, the weird. An Alphabet of Embers would live in that space between poetry and prose, between darkness and sound, between roads and breaths, its pages taut with starlight; between its covers, words would talk to each other, and have an occasional cup of tea. I am looking to publish about 30 or so pieces of lyrical prose and unclassifiables in a mix of originals and reprints. If this Kickstarter funds, I will pay SFWA pro rates at 6c a word for originals, and 3c a word for reprints. I will read pieces between 500-1400 words long. Please help me make this beautiful thing happen! There will be an open call for submissions posted as soon as the goal is reached. I am so excited about this anthology, and can't wait to begin reading work! UPDATE: I have posted the preliminary submissions guidelines for the project! Stretch goal 1: if the funding reaches $6500, I will commission internal art (either illustrations or works inspired by the anthology). Stretch goal 2: if we reach $7000, I will commission an additional piece of music from the Banjo Apocalypse Crinoline Troubadours, and send it to all backers. Stretch goal 3: MORE TO COME!!! Art By Galen Dara: cover art, postcard, and limited edition prints of the cover signed by the editor. Galen Dara has illustrated for 47 North Publishing, Fireside Magazine, Lightspeed Magazine, Apex Publications, Lackington's Magazine, and Edge Publishing. Recent Cover art includes Oz Reimagined, edited by John Joseph Adams and Douglas Cohen, The Chapel Perilous by Kevin Hearne, the Women Destroy Science Fiction issue of Lightspeed Magazine, War Stories edited by Jaym Gates and Andrew Liptak, Glitter & Mayhem edited by John Klima and Lynne M. Thomas, and Heirs of Grace written by Tim Pratt. Her art was chosen for inclusion in Spectrum 20 and Spectrum 21. She is the winner of the 2011 Orycon33 Art Show Directors Choice award, the 2013 Hugo Award for Best Fan Artist, and is a nominee for the 2013 Hugo Award for Professional Artist. Voice of the Seastar: in addition to swag (see reward level), I will write a poem for you! You will choose an element, a stone, and a texture for me to work with. If you'd like something more specific, we can talk! Previous work I've written for various fundraisers includes Godfather Death (for JoSelle Vanderhooft), Between the Mountain and the Moon (for Izlinda Hani Jamaluddin), Plucked from the Horo (for Brittany Warman), and more. $100 will buy a poem of up to 100 lines; please pledge $200 if you want epic length. After the poem is delivered, I may opt to submit it for publication, in which case a dedication to you will be displayed! Embersong: The theme song for the anthology! I have composed the words, and Emily is hard at work setting them to music. This is not my first collaboration with Emily – she has composed music using my poems "Walrus" and "Salamander Song" – the latter of the collaborations is scheduled to appear in Strange Horizons. Emily Jiang delights in setting beautiful texts to music. Her compositions have been performed by the San Francisco Choral Artists, the Gunn High School Choir, and The Emily Jiang Singers. She’s currently working on an album that’s a musical companion to her book, Summoning the Phoenix: Poems & Prose about Chinese Musical Instruments. Spelling the Hours: a bonus chapbook created especially for the anthology, celebrating Others in science and technology. Taking Sofia Samatar's "Girl Hours" as a cornerstone, I am soliciting my favorite Stone Telling poets to write poems focusing on forgotten figures of science and technology, especially women, queer people, trans people, PoC, and members of other underrepresented groups. This will be a wonderful accomplishment! More about the chapbook here. Here, We Cross: the first anthology I edited through Stone Bird Press. It collects twenty-two queer, trans, and genderfluid poems from the digital pages of Stone Telling magazine. The speculative poetry in Here, We Cross is diverse and varied, including poems with speakers or protagonists who are lesbian, gay, bisexual, genderqueer, trans, asexual, and neutrois; speakers who struggle with the body and the society’s imposed readings of that body. It is a painful book, a triumphant book, full of works that soar and breathe and live. STRETCH GOAL: A song composed, sung, and recorded as video by The Banjo Apocalypse Crinoline Troubadours. They are C.S. E. Cooney, Amal El-Mohtar, and Caitlyn Paxson - friends, writers, performers, and musicians who’ve banded together to share their work with the world. Scattered across the globe, they do not so much travel together as spontaneously occur. Whenever two or more are gathered, you can be sure of a well-dressed apocalypse. This is the second Stone Bird Press anthology, after Here, We Cross. The Stone Bird team has also been publishing two online magazines, Stone Telling and inkscrawl. We have collective experience and expertise to successfully meet challenges, and we are committed to delivering a quality product to backers in a timely fashion. 1. The anthology may not get enough suitable submissions during the open submissions period, in which case the submissions period would need to be extended. 2. Since this is a print anthology, there may be delays associated with a printer's production schedule. Neither of those is a major risk. To be on the safe side, we have allowed ourselves a generous timeframe for both editing and printing. We have already produced another anthology, so we have experience with the process. SPARK: A big ole thank you, and a mention on our donors' list. FIREDUST: A mention on our donors' list, PLUS the ebook of An Alphabet of Embers. EMBERGLOW: A mention on our donors' list, the ebook version of An Alphabet of Embers, PLUS a postcard featuring the Alphabet of Embers cover art by Galen Dara. PHOENIX FEATHER: a mention on our donors' list, a postcard featuring the Alphabet of Embers cover art by Galen Dara, the ebook version of An Alphabet of Embers, AND the ebook version of Spelling the Hours. A TRAIL OF SPARKS: a mention on our donors' list, a postcard featuring the Alphabet of Embers cover art by Galen Dara, PLUS the trade paperback AND ebook versions of An Alphabet of Embers (book and postcard ship together). EMBERSONG: a mention on our donors' list, a postcard featuring the Alphabet of Embers cover art by Galen Dara, the trade paperback and the ebook versions of An Alphabet of Embers, AND the mp3 of "Embersong" (the theme song of the anthology, put to music and sung by Emily Jiang). A HEART OF STARFIRE: a mention on our donors' list, a postcard featuring the Alphabet of Embers cover art by Galen Dara, the trade paperback and the ebook versions of An Alphabet of Embers, the mp3 of "Embersong" (the theme song of the anthology, put to music and sung by Emily Jiang), and physical and ebook editions of Spelling the Hours. A LIBRARY OF EMBERS: a mention on our donors' list, a postcard featuring the Alphabet of Embers cover art by Galen Dara, the trade paperback and the ebook versions of An Alphabet of Embers, the mp3 of "Embersong" (the theme song of the anthology, put to music and sung by Emily Jiang), physical and ebook editions of Spelling the Hours, PLUS a physical copy of Here, We Cross. PHOENIX WINGS: a mention on our donors' list, a postcard featuring the Alphabet of Embers cover art by Galen Dara, the trade paperback and the ebook versions of An Alphabet of Embers, the mp3 of "Embersong" (the theme song of the anthology, put to music and sung by Emily Jiang). IN ADDITION, you will receive a limited edition 11x17 poster of the cover, featuring art by Galen Dara, and signed by the editor. OUR TRUTHS SPELLED OUT: a mention on our donors' list, a postcard featuring the Alphabet of Embers cover art by Galen Dara, the trade paperback and the ebook versions of An Alphabet of Embers, the mp3 of "Embersong" (the theme song of the anthology, put to music and sung by Emily Jiang), and physical and ebook editions of Spelling the Hours. IN ADDITION, you will receive a paperback copy of Here, We Cross, AND a paperback copy of The Moment of Change. A DIALECT OF FIRE: a mention on our donors' list, a postcard featuring the Alphabet of Embers cover art by Galen Dara, the trade paperback and the ebook versions of An Alphabet of Embers, the mp3 of "Embersong" (the theme song of the anthology, put to music and sung by Emily Jiang). IN ADDITION, ask me a question about sociolinguistics (other branches of linguistics considered, but no formal syntax, please) and I will respond with an entry on my blog, answering your question. VOICE OF THE SEASTAR: a mention on our donors' list, a postcard featuring the Alphabet of Embers cover art by Galen Dara, the trade paperback and the ebook versions of An Alphabet of Embers, the mp3 of "Embersong" (the theme song of the anthology, put to music and sung by Emily Jiang), and physical and ebook editions of Spelling the Hours. IN ADDITION, I will write a custom poem for you. You will choose an element, a stone, and a texture for me to work with. If you'd like something more specific, we can talk! $100 will buy a poem of up to 100 lines; please pledge $200 if you want EPIC length. A PHOENIX TREASURY: a mention on our donors' list, a postcard featuring the Alphabet of Embers cover art by Galen Dara, the trade paperback and the ebook versions of An Alphabet of Embers, the mp3 of "Embersong" (the theme song of the anthology, put to music and sung by Emily Jiang), and physical and ebook editions of Spelling the Hours, as well as a paperback copy of Here, We Cross, a paperback copy of The Moment of Change, and a limited-edition 11x17 poster of the Alphabet of Embers cover featuring art by Galen Dara. A FIELDWORK IN FIRE: The rewards of A DIALECT OF FIRE, only I will invite another linguist or two to engage in a dialogue with me, in response to your question. In addition to sociolinguistics, we are likely to be able to respond to questions about cognitive science, computational linguistics, and atypical language processing (other prompts considered). IT CAME FROM THE FIREBIRD'S NEST : a mention on our donors' list, a postcard featuring the Alphabet of Embers cover art by Galen Dara, the trade paperback and the ebook versions of An Alphabet of Embers, the mp3 of "Embersong" (the theme song of the anthology, put to music and sung by Emily Jiang), and physical and ebook editions of Spelling the Hours, and a limited-edition 11x17 poster of the Alphabet of Embers cover featuring art by Galen Dara. IN ADDITION, you will receive a surprise assortment of odd and beautiful things. They may include: small books; poems; small art; vintage pieces; stones; other surprises. THE STUFF OF LEGEND: a mention on our donors' list, a postcard featuring the Alphabet of Embers cover art by Galen Dara, the trade paperback and the ebook versions of An Alphabet of Embers, the mp3 of "Embersong" (the theme song of the anthology, put to music and sung by Emily Jiang), and physical and ebook editions of Spelling the Hours, as well as a limited-edition 11x17 poster of the Alphabet of Embers cover featuring art by Galen Dara. IN ADDITION, I will be at Readercon 2015 and perform, to you and your group of up to 20 listeners, the Greenlandic Lay of Atli (Atlakviða in grœnlenzca) in the original Old Norse. I will recite it from memory, and I will supply the audience with a translation I will prepare. Please note that the poem is both VERY LONG and EXTREMELY BLOODY. This will be epic, and this will never repeat. THE FLAME IN ALL ITS SPLENDOR: a mention on our donors' list, a postcard featuring the Alphabet of Embers cover art by Galen Dara, the trade paperback and the ebook versions of An Alphabet of Embers, the mp3 of "Embersong" (the theme song of the anthology, put to music and sung by Emily Jiang), and physical and ebook editions of Spelling the Hours, and a limited-edition 11x17 poster of the Alphabet of Embers cover featuring art by Galen Dara. You will also receive a surprise assortment of odd and beautiful things. They may include: small books; poems; small art; vintage pieces; stones; other surprises. I will also write a poem for you. IN ADDITION TO ALL THESE GOODIES, the book will be dedicated to you!